I hope you are having a terrific summer! We have stayed really busy. 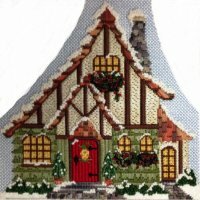 Our Knitting classes with Margaret and Needlepoint classes with Gina, Brenda and Meredith have been really fun. Margaret has a couple of classes she is organizing. 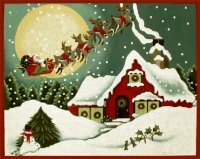 The first is a Christmas Stocking class to be held in the fall. I will send the details as soon as the dates are firm. She is also working on a weaving class. Looks like it will be in October. I promise you the scarf you make in this class will knock your socks off! As soon as these dates are firm I will send another email. 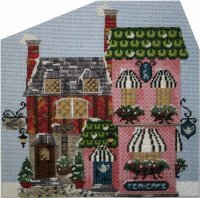 Gina is busy with her decorative stitch classes on Tuesday, Wednesday, Thursday and Saturday. If you want to make your needlepoint canvas really beautiful, take a class. Gina is also planning a Christmas canvas work shop. Dates and details to come soon. Here is the canvas..
We are also launching our next club in December. The first set will be 4 village buildings and three smaller accent pieces. There will also be miniatures to embellish the buildings included in the kits. The second set will have 4 more buildings and three accent pieces. Here are a few pictures to get you excited! As soon as these get back from the finisher I will send more pictures. All Dede Canvases are 20% Off during the show. Here is a link to her canvases if you can't get to the shop. Give us a call and we can send your canvas to you. For you locals, Hodge Podge has a couple of sale tables also!! No returns, wrap or exchanges on sale items.